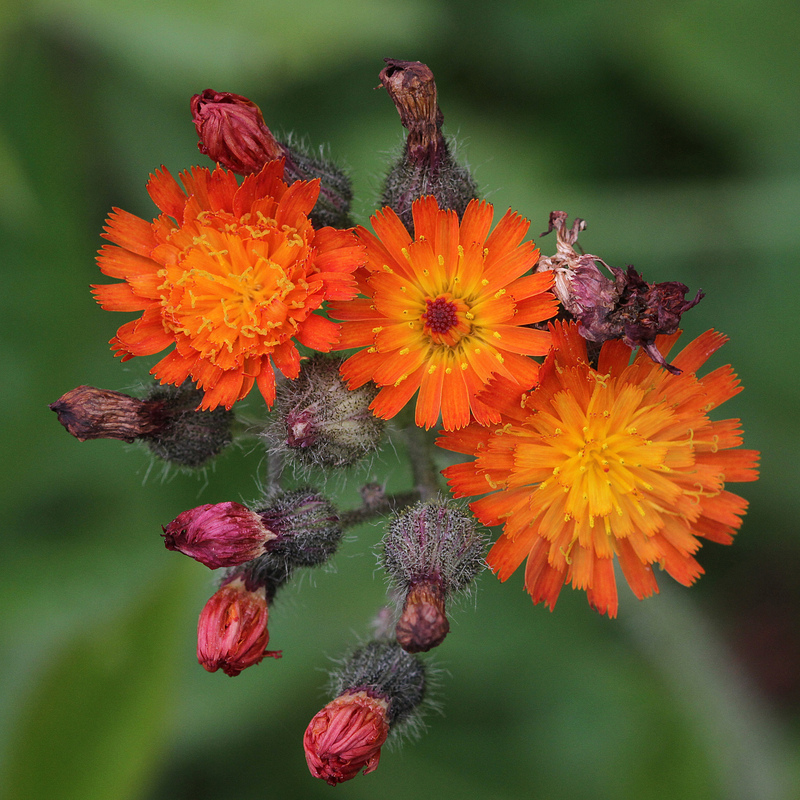 General Description: Orange hawkweed is a perennial that has fibrous roots and rhizomes. Its flowering stems grow 7.9 inches to 35.4 inches (20 to 90 cm.) tall. It exudes a milky sap when injured. Flower Description: Flowerheads in compact to open clusters of 3 to 7 (to 12+). Flowerheads are showy, red on the margin with an orange center, 1 inch in diameter and composed of all ray flowers. Bracts at the base of flower heads with various types of hairs. Leaf Description: Leaves all basal except for one or two stem leaves. Basal leaves with a rounded to narrowly rounded blade that tapers in at the base. They are generally 3 to 5 (or more) times longer than wide. Basal leaves with hairs on both sides. Stem Description: Stems grow up to 35.4 inches tall and have simple, stellate (star-shaped) and glandular hairs. It's an aggressive, unpalatable competitor of pasture and range plant species, crowding out more desirable forage. It is a serious pest of lowland pasture, mountain meadows and lawns. It’s sold as an ornamental plant in nurseries.